Well it is graduation time all across the country. Hearts are swelling with pride as proud parents and grandparents are doting on their graduates. It is especially near and dear to us as we have had two college graduations this year. 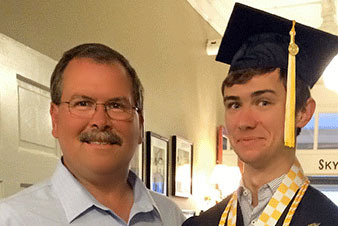 Our first graduation was Aaron’s, who graduated from Georgia Tech in nuclear engineering. Neal and I were proud as a peacock when his son walked across that stage receiving his honors degree. What a glorious day! I can’t believe he returns in the fall to complete his master’s degree. It seems that we just moved him into that tiny dorm room yesterday, but it has been four years of hard work and dedication. Neal and I commented that he had a grown up look on his face that day. The young man that left us four years ago has grown into an adult. His face looked different, he carried himself differently, and his outlook on life is different. He has matured right before our eyes. 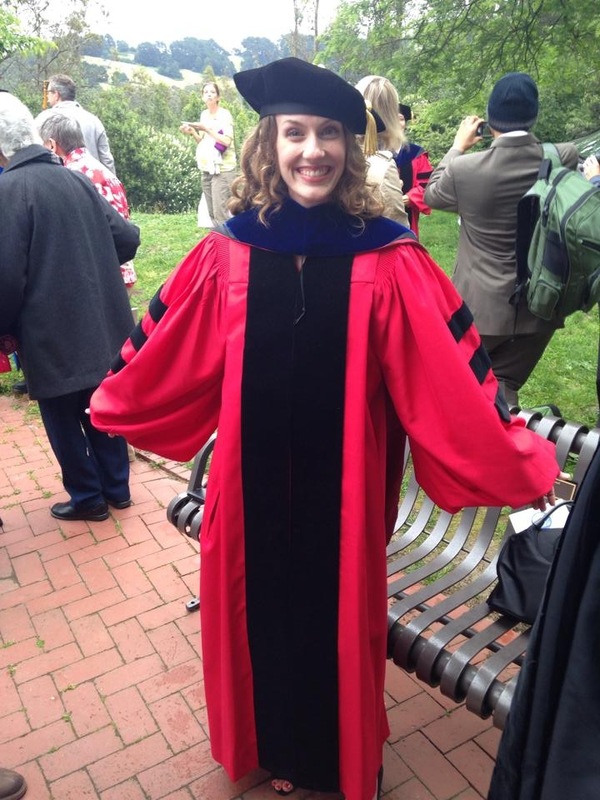 My niece Beth received her doctorate in systematic and philosophical theology from The Graduate Theological Union in Berkeley, California. She and her husband moved there several years ago and set on their journey to complete their education. Beth is the only granddaughter in our family. My brother and I had two boys and my sister had a boy and a girl…so she was the princess, and rightfully so. I was completely thrilled to see the red robe as that is my signature color. I tried her whole life to brainwash her into choosing red for her favorite color too. I bought Beth her first pair of red shoes and a dress with embroidered cherries to go with it. And we got a curly perm to complete the look; all while my sister was in the hospital birthing Beth’s new brother many years ago. She and I are red girls (at least I think so). And to add to the wonderment, our grandson Hays is graduating from 5-year-old Kindergarten. He is at a beautiful place in his life where his thoughts are about where we were going to eat to celebrate, secretly hoping for pizza! Walk with me as I grow. Watch me as I explore life. These three simple lines sum up every child’s desires. They want us to walk steps with them as they grow up and watch them as they explore all the wonderful things life has to offer. But the main thing anyone wants is to be loved unconditionally. Loving unconditionally means celebrating a person because of who they are, not because of what they have accomplished. Loving means I love you because you are YOU, and getting to celebrate their accomplishment with them is just an additional joy. Congratulations to all of you who have someone graduating this year. 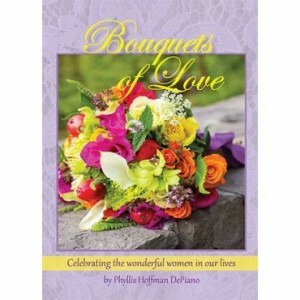 Order Your Copy of Bouquets of Love Today! Found you by way of The Enchanted Home and so glad I did! You are an inspiration. Love your blog! Started reading your graduation blog and saw that so many people came to this blog from Enchanted Home. So I went there and read your interview. Had no idea that you started The Cross stitch magazine. I love Victoria and subscribed to the first Victoria Magazine and like many others was so disappointed when it disappear and cheered when you brought it back. Thank you for being so creative. Look forward to more of your endeavors. I love all of your magazines and I’m so glad Victoria has returned. It’s wonderful to have these great southern magazines to celebrate our southern lifestyle. I am here from Enchanted Home and so happy to find your blog and can’t wait to receive it. Hi Phyllis, thanks so much for the return of Victoria magazine, my girls and I did the happy dance we saw it sitting on the magazine rack again. So, so thankful for Tina from The Enchanted Home for sharing your blog with me! Hello, Phyllis! 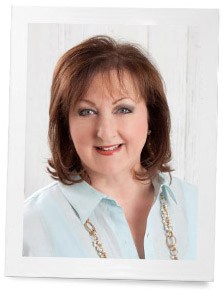 I have subscribed to many of your publications (Victoria, Southern Lady, Cooking with Paula Deen, Fresh Style, the Cottage Journal) for years now and learned just today about your blog from Tina at The Enchanted Home. Keep up the good work with your magazines! I love each and every issue. Phyllis, came over from The Enchanted Home, I loved reading your post about how the magazine Victoria came back because of you…. Thankyou so much! My mom and I both collect Blue and White also!!!! We each have to have our own copy of your magazines, We don’t want to share…….. Came over from The Enchanted Home, so glad to see you have a blog! I love reading blogs and yours seems very interesting. Hello, Phyllis! I’m visiting from The Enchanted Home and have absolutely fell in love with your blog. I am subscribing right after I post this comment. I thoroughly enjoyed your interview and the pictures of your home. You are quite inspiring! I look forward to receiving your blog posts. congratulations to the grads and their loved ones who encouraged them along the way! thanks for your wholeheartedness in the interview with tina today, phyllis. i look forward to following your journey and discovering more about your projects and writing. as a writer myself, i deeply honor the depth we can bring to decor/creative arts online and in print through our words and thoughtfulness, and i am always seeking kindred spirits in this technological realm where images and the visual (at least for now) so often trump such writing. best to you this week! I am visiting from The Enchanted Home. I have read your magazines for a long time, but did not realize you also wrote a blog. I will definitely follow it. Hello Ms. Hoffman, I loved reading your interview at The Enchanted Home today, and I’m excited to subscribe to your blog, which I know will be inspiring on a daily basis. I did not grow up in a gracious home, but I do aspire to create one, and I know I will find wonderful guidance here! Being granted a peek inside the homes and lives of lovely accomplished women is a treat which warms my heart! Congratulations to the graduates in your family. They are two wonderful young people starting out on life’s adventure. I can see you are as proud of your niece, as you are of your son. Congratulations Aaron & Beth! Loved your interview on Tina’s blog. I must say Victoria Magazine was a favourite of mine for years, until it was discontinued. I still have all the Christmas issues and pull them out every November to inspire and get that Holiday feeling. I’m signing up as a follower of your blog. I look forward to reading you in the morning. I have a feeling you will inspire. I so enjoyed reading about you over at The Enchanted Home today. Victoria has always been my favorite – the photography and articles are always so beautiful and well written. Needless to say I was thrilled when it was resurrected! Yours is an inspiring story and your home and tables are as well! Congratulations on all of the graduates in your family. Congratulations to your graduates and for your beautiful blog. I’ve signed up after reading about you on The Enchanted Home. Best wishes and I look forward to your visits in my inbox. I was so interested to read about you on the Enchanted Home blog. For many years now, copies of your magazines have found there way into my home because I thought they would transport me to my “happy place” and they have. Thank you for your efforts to sustain us all in the belief that a beautiful home contributes to a happy life. And do think about bringing back Southern Accents…please?! Coming over from Tina’s place. What a wonderful life you are living. I’m following. Congratulations to your graduates and for your beautiful blog. I’ve signed up after reading about you on The Enchanted Home. I love that your blog name is related to Alexandra Stoddard who has been mentor and inspiration to me through her numerous books for many years. Best wishes and I look forward to your visits in my inbox! Congratulations! I loved exploring your blog! I think it is going to be a big success! I found you over on The Enchanted home! Wow a big congrats to you Phyllis! That is sooo exciting, you have every reason to be incredibly proud. I am totally for unconditional love, that is something that is natural to most parents and I think its our first time of truly loving unconditionally. Enjoy all the celebrating! I loved the text… didn’t bother me at all that you spoke of things “you” did because it was obvious these were wonderful memories of yours with your niece Beth. It was equally obvious that you and Neal are “over the moon” with Aaron’s academic achievements. Surely, doesn’t mean you are less thrilled with Beth’s academia or your memories of past days with Aaron. I just can’t be bothered with “his vs her” accolades. We (both sexes), have our place on this earth and in God’s eyes. Congratulations to both; the beautiful and handsome graduates of 2014! I read this post with some dismay……I had just attended a wonderful session this week on “Unraveling Feminine Beauty Standards’ and my friend verbalized it VERY well when stating: Phyllis, are you aware of how these comments are perceived by some of us who are committed to promoting gender equality. When you describe your niece’s graduation it is mostly about you, your love of red and your generosity toward her in your attempts to convince her of becoming a ‘lover of red.’ Compared to the ways in which Aaron has grown and matured and developed as a young man, you say nothing about her major accomplishments and the efforts that she has put forward in achieving her PhD. It feels very thin, and reinforces the notion that boys are more worthy of our accolades. I’m sure that it was not intended, but it does perpetuate a concern about equality.” To which I would add that your niece is referred to as a “princess” and so then why is your grandson not referred to as a ‘prince’? Plus you indicate that your niece is married – bringing another male into the picture (was that important to her academic achievement?) Another friends comment was: Niece must look great on graduation day and grandson is acknowledged for his hard work and dedication. How insidious patriarchy and gender roles become. I am now conscious of how I address my girl friends and what the first thing out of my mouth is…looks or character, what to choose?? ?Of course, character or deeds, but how we will have to work to change the face of gender socialization. My hope is that we would all see the achievements of EACH INDIVIDUAL – not only of the male gender!! How sad you are so critical rather than sharing her family joy. You missed the point choosing to be a critic. Sad. Well said, Emma. I find Pearl’s comments to be rude. This political correctness has gotten out of control. Enjoy your family, Phyllis! Happy day for all! This is a beautiful text. Thank you. Let’s have a thought for all those beautiful kids, teenagers, young adults who have more challenges in life due to their health and can not go up to graduation. Their parents are as proud or even more to see them do tremendous efforts in their day to day life. I absolutely agree. All children should be celebrated daily. There should not be a day go by when they are not celebrated. Thank you for your note.